Somewhat disappointingly, this turned out to be a publicity stunt on the part of Friends of the Earth, complete with protesters wearing corn costumes and waving banners. Nonetheless, the story behind the stunt is fascinating. 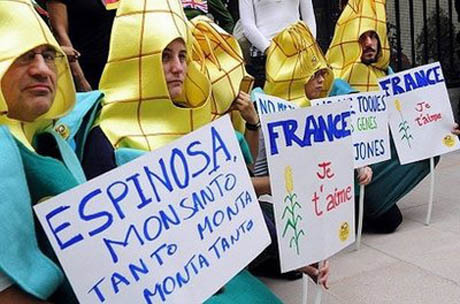 IMAGE: Friends of the Earth protesting on behalf of non-GM corn (AFP/Dominique Faget). In 1998, the first planting of Bt corn (transgenic event Bt-176 by Syngenta, Basel) in Spain reached 20,000 hectares. The cultivated area remained fairly stable up to 2003, when the EU approved another Bt corn (transgenic event MON-810 by Monsanto, St. Louis). By 2006, over 53,000 hectares of Bt corn were grown in Spain—15% of the country’s total corn hectarage. IMAGE: Non GM corn and the corn borer pest (Wikimedia). GM corn is grown in Spain without any precaution against contamination…. Faced with this threat to its survival, the corn is forced to flee the country. Better to become French than genetically modified! Plants cannot (yet) legally claim asylum, but the idea that corn might seek to change its citizenship for fear of inter-species persecution is a perfect illustration of the logical absurdity built into the (very necessary) project of plant health management. The problem is that while national governments possess the legislative authority to regulate plant movement, plants and their pollinators tend to observe biological borders, rather than state sovereignty. Meanwhile, the plants themselves are merrily cross-pollinating, and extending or shifting their “natural” range across national borders in response to climatic or environmental conditions, frequently in direct contravention of the laws governing their movement by humans. The use of legal devices to enforce biological barriers is, of course, at the heart of quarantine regulations. Perhaps one outcome of this autumn’s “Landscapes of Quarantine” design studio could be draft legislation to establish a protocol for international agricultural asylum? For a more practical exploration of the challenges involved in enforcing plant quarantine, look out for a forthcoming interview (to be posted here and on BLDGBLOG) with the Plant Health Protection Officer at the Royal Botanic Gardens, Kew. This entry was posted in Landscapes of Quarantine. Bookmark the permalink. Trackbacks are closed, but you can post a comment.